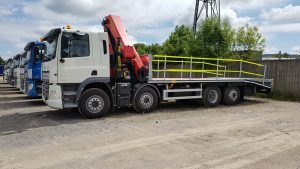 Home / Industry News / LC Vehicle Hire, took delivery of a DAF 8×2 crane truck fitted with a Sterling cheesewedge plant body. LC Vehicle Hire, took delivery of a DAF 8×2 crane truck fitted with a Sterling cheesewedge plant body. LC Vehicle Hire, recently took delivery of a DAF 8×2 crane truck fitted with a Sterling cheesewedge plant body. This marks the completion of a 15 unit order for 2018 manufactured by Sterling GP. All chassis’, which were supplied by Bob Bosco, Evans Halshaw Leeds, were ‘facelifted’ DAF 8×2 FAX day cab chassis with rear lift and steer axle. Leeds Commercial chose to fit this truck with a Palfinger PK41 EH lorry loader crane mounted behind the cab which was installed in Bradford. Giving the best loading angle, the plant body is equipped with the renowned Sterling fold forward ‘Cheesewedge’ ramp system. The Cheesewedge ramp forms a totally flat deck when folded. 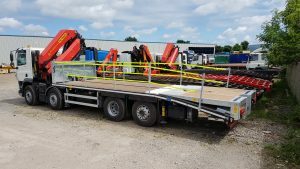 This configuration makes the truck extremely versatile – ideal for crane work with cabins and containers or transporting plant machinery and powered access platforms when ramps are deployed. An electric winch has been fitted to the front of the body to assist loading when necessary. From mini diggers to cabins, spider lifts to dumpers, this truck will handle a wide variety of loads with ease. Minimizing the risk of falls from a height, a ‘post & socket’ fall arrest system was fitted to give protection to the driver. It is also equipped with the latest camera and sensor systems to give the driver maximum visibility of vulnerable road users such as cyclists in urban areas. Lastly, the truck is fully compliant with safety regulations such as FORS and Crossrail standards. I was very impressed with the quality of the builds and the detailed build schedule they gave me. LC Vehicle Hire is an industry-leading commercial vehicle supplier for both self-drive rental and sales of LGV’s and HGV’s. 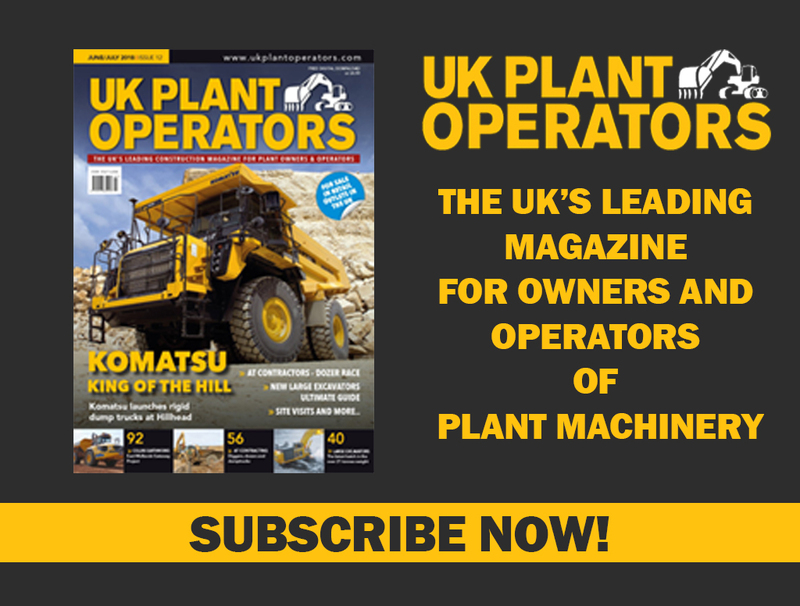 Running a fleet of nearly 2000 vehicles from its 6 nationwide Depots, the standard of their truck specification shows their dedication, investment, and expertise. They believe in providing the best specification vehicles to meet their clients’ complex needs and working standards. 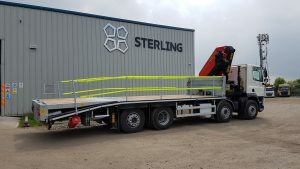 This concludes a large order of plant bodies from Sterling for 2018, which included in total 9 ‘beavertail’ bodies and 6 crane specification bodies, fitted to a range of DAF and Mercedes (8×2 and 6×2) chassis’. The trucks were delivered to a precise schedule throughout the year between February and September. The Construction Industry Technology Association #CITA Whats it all about..